It’s always a good idea to get an instant tent, and especially so before heading out on a camping trip with the family as it will help make sure you get the most of your outdoor experience – almost hassle-free. Instant tents are easy to set up so you can start enjoying your camping trip faster than ever before. Even better, these tents are able to accommodate and have a range of in-between 2 to 8 people. 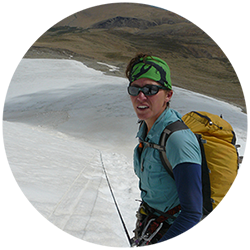 In this article, you will find all the information you need for choosing the best instant tents for your next adventure. Browse through these top products, their reviews, and a comparison chart. In the section below, you will find a handy comparison chart of the top 5 best instant tents on the market along with their rating, capacity, dimensions, and color. 8 people 13 ft. x 6 in. x 9 ft. 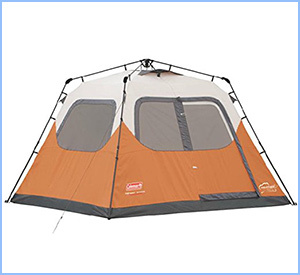 This roomy tent is one of the best tents to fit up to eight people inside at one time. Its comfortable interior makes it great for camping trips with multiple people. It is easy to set up as well with the pre-attached poles. This tent also sports a weather system that keeps you nice and dry inside even in rainstorms. 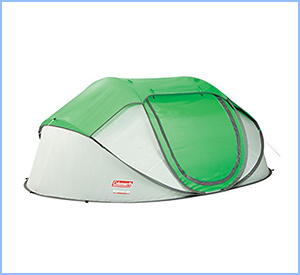 There are two doors and seven different windows in this tent for great ventilation. There are even room dividers that can be removed depending on your preferences. 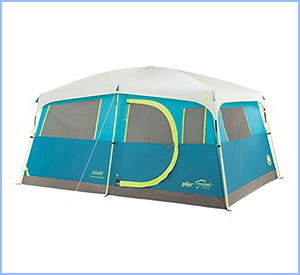 This tent sports a special room divider that makes it great for camping with more than one family. Included with the tent is a rain fly, a carry bag, and the necessary tent stakes for setup. This tent also has a special water-resistant technology that keeps you dry when it rains, and the adjustable ground vent is ideal for keeping the air inside the tent ventilated. You can fit at least two Queen air mattresses in it, and up to nine people can sleep in it, and do so comfortably. This is one of the best tents for anyone looking for a quick setup as it has one of the easiest setup processes. The tent can easily be set up in just a few minutes, and it even packs away flatly for storage when you are done with the tent. There are two different storage pockets inside the tent to help keep your gear organized. The rainfly is ideal for keeping you dry and ventilated at the same time, and the taped floor keeps you dry from the bottom up. For a unique take on an instant tent, this fantastic design is both waterproof and easy to set up for a faster camp setting. 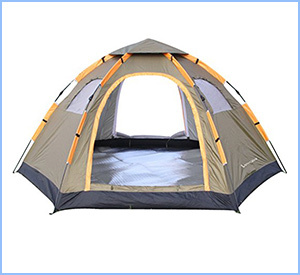 The generous footprint of this tent, sitting at ten-by-seven-foot, is ideal for families of six to comfortably sleep. This tent is even engineered to be wind resistant, water resistant, and stronger than other brands. It even has anchor tents and redesigned poles for added durability. 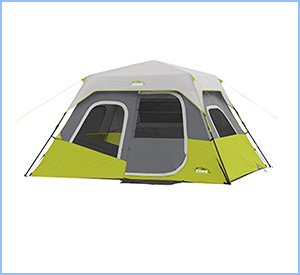 This tent sets up incredibly fast since it comes with color coated poles that are pre-attached. It also has a snag-free suspension and a weather system that helps keep the water out of the tent. The tent is also made from a water-resistant material that is more water resistant than typical tents. 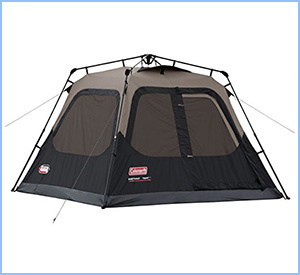 Another thing that makes this one of the best tents on the market is the built-in closet with shelves and a hanger bar for gear and clothes during your camping excursion. This polyester tent is made in the USA. It has pre-attached poles to help make the setup of this tent faster and easier than regular tents. All you have to do is extend the poles and secure them. Since this tent is one of the best instant tents, it is made with a special weather system that inverted seams to keep the water out during heavy rain. There is also an integrated rainfly added for airflow. Don’t forget to bring an LED spotlight to make that evening spent in the outdoors that much longer. With a gear loft, lantern hook, and wall organizer, you can easily get the most out of this tent. It sets up quickly and easily, and it is roomy enough to fit two Queen sized mattresses. With a special H2O block technology, this tent works to keep you dry even when it’s raining outside. There is an electrical cord port for access, but it can be closed completely when not in use. Also included with this tent are a carry bag for storage, rain fly, and tent stakes for setup. Coming with one of the fastest tent setups, this instant tent takes only a few minutes to set up and take down, so you don’t lose any time during your camping trip. The poles on this tent are pre-attached to the tent, so you don’t have to worry about setting up poles in the right place at the right time. The dimensions of this tent are about 10-foot x 9 foot since the tent sleeps up to six people comfortably. This water-resistant tent comes with a rainfly for added protection from the elements. 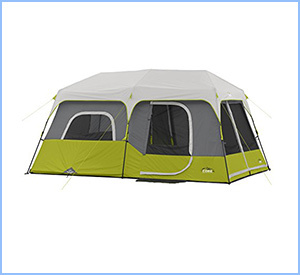 It even sports two windows for added ventilation in the tent, so you aren’t stifled while you sleep. 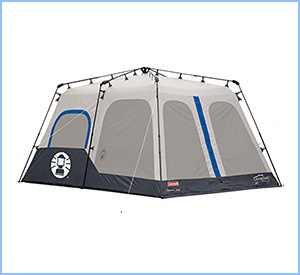 The tent comes with a one year warranty, and it can comfortably sleep four people at the same time. There is no hassle to put up this tent either. Camping is always more fun with an easy instant tent. These tents pop up quickly and can fit anywhere from 2 to 8 people inside without feeling crowded or too much hassle. 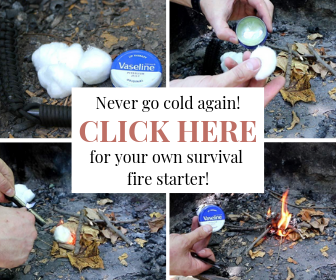 All in all, this article should have given you a good starting point and a direct link to some of the best instant tents on the market and the place to get them from. What instant tent are you going to take on your next adventure? You could also easily bring a camping chair along for the journey too! 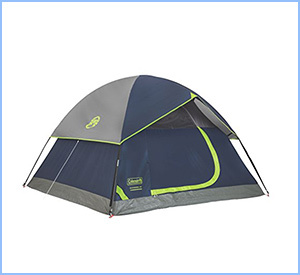 This Article was Updated in April 2019 to Present the Latest and Best Instant Tents and Removed Products that Are No Longer Available.